Congratulations! 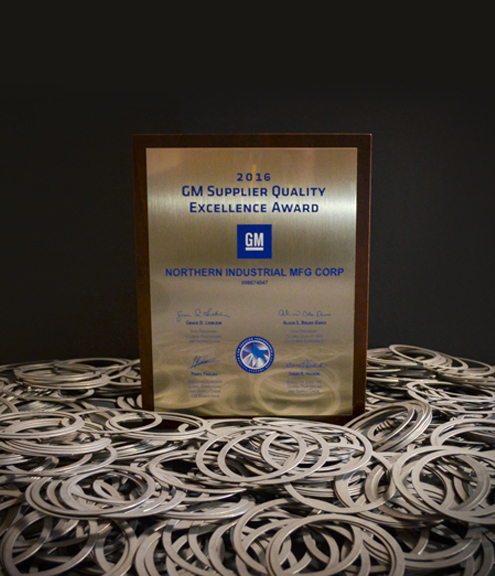 You are receiving this letter because one or more of your manufacturing location is being awarded the General Motors Supplier Quality Excellence Award for the 2016 award year. This is the fourth year Global Supplier Quality & Development will be presenting this prestigious recognition award. The award is given to specific manufacturing locations and only our top performing suppliers are eligible to receive it. Suppliers who receive this award have met or exceeded a very stringent set of quality performance criteria and have achieved the cross-functional support of the entire GM organization. Overall, General Motors’ mission is to design, build and sell the world’s best vehicles with the highest levels of quality and safety on the road. Achieving this mission depends largely on the quality of the parts you produce day in and day out. We know that maintaining a focus on the details to achieve perfection each day is not an easy task, so much so that only a fraction of our suppliers have earned this special recognition. You are a critical part of the team who helps ensure the customer is delighted with their product purchase and we want to recognize and thank you for that. Please accept this letter as official notification of your award status. Your GM SQEs will contact you to deliver the award plaques. Again, congratulations on an exceptional team effort that helped your facility to win this award. Thank you for all you do to make our products great for GM, for you, and ultimately for our customers.